The Sony Xperia Z3 Compact phonebook is integrated with the dialer using a tabbed interface - the Contacts, Phone, Favorites and Groups tabs can be side-swiped. The contact list has a dedicated search field plus it offers and a cool alphabetical scroll bar. 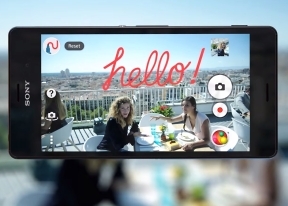 Calling on the Sony Xperia Z3 Compact is okay. It held onto signal just fine even in tight urban spaces and the sound coming from the speaker was loud enough. The clarity is only average on our side while the other line reported we came in fine enough. The Sony Xperia Z3 Compact scored an Average on our loudspeaker test. The quality of the sound generated is good, but is just not that loud, likely due to the waterproofing. Here's how it stacks up to other devices. You can find out more about our testing here. Text messages and MMSs use standard threaded layouts. Adding multimedia (photos, videos, sounds, etc.) will convert the message automatically into an MMS. As for text input, the Xperia Z3 Compact offers a customizable on-screen full QWERTY keyboard.